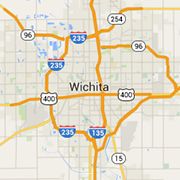 Check out these Wichita spas, fitness centers, health clubs, tanning salons, hair salons, barbers and more. Portable massage services for both people and pets. Salon Q is an energizing full-service hair and facial waxing salon, located in the heart of Old Town. The leader in high quality health and fitness equipment for both home and commercial applications...for the last 30 years! Dr. Ryan Muller is an expert Chiropractor and the only Spinal Remodeling Specialists in the Wichita area dedicated to helping you feel and function awesome again!